Product prices and availability are accurate as of 2019-04-20 02:45:45 UTC and are subject to change. Any price and availability information displayed on http://www.amazon.co.uk/ at the time of purchase will apply to the purchase of this product. Hi Mr Dj are proud to offer the fantastic 0.3m Patch Lead, Right Angled Stereo TRS 1/4" Jack - Re'an, Red. With so many DJ products available recently, it is wise to have a brand you can recognise. The 0.3m Patch Lead, Right Angled Stereo TRS 1/4" Jack - Re'an, Red is certainly that and will be a perfect purchase. 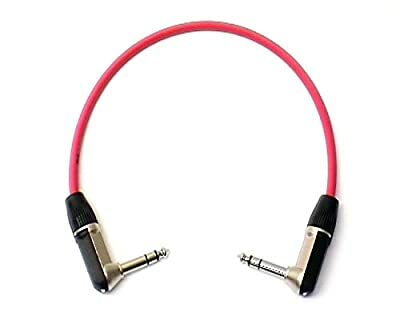 For this price, the 0.3m Patch Lead, Right Angled Stereo TRS 1/4" Jack - Re'an, Red comes widely respected and is a regular choice amongst many of our customers. Rapid Cables have included some excellent touches and this results in a great bargain price. High quality balanced patch cable terminated both ends with a 90 degree / right angled TRS jack plug. Used typically for balanced equipment. Connectors: Re'an (Neutrik) NYS208 stereo 6.35mm (1/4") right angled jack plugs.